A conference organised by the Trade Union Group of Campaign against Climate Change. Open to all trade unionists and environmental activists. Timed to coincide with the UN climate talks in New York and the New York “People’s Climate March”, this conference will have a strong international theme with links to participants on the New York march and speakers from Climate Jobs campaigns in other parts of the world. It will also launch the third edition of the “One Million Climate Jobs” booklet which now has additional sections, including one on alternatives to fracking. This will be a major event for discussing how we move the campaign forward and will outline plans for the national “Time to Act on Climate Change!” mobilisation in London on 7 March 2015 and the Paris demonstrations prior to the crucial COP talks in December 2015.
a) “Unpacking Climate Jobs” – looks closely at specific climate jobs and how they can be created. c) “Students, Environment, and Climate jobs” – deals with climate jobs for graduates but also encompasses the curriculum and student involvement in the climate movement. Closing Plenary: “Time to Act on Climate Change” – speakers from the “Time to Act!” campaign and the protest movement for the Paris COP talks. Followed by Q & A.
https://www.facebook.com/events/1449652681972280. You can book your place by going to http://www.eventbrite.com/e/the-international-fight-for-climate-jobs-for-a-future-that- doesnt-cost-the-earth-tickets-5743228150. 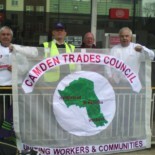 This entry was posted on August 26, 2014 by CAMDEN TRADES COUNCIL.